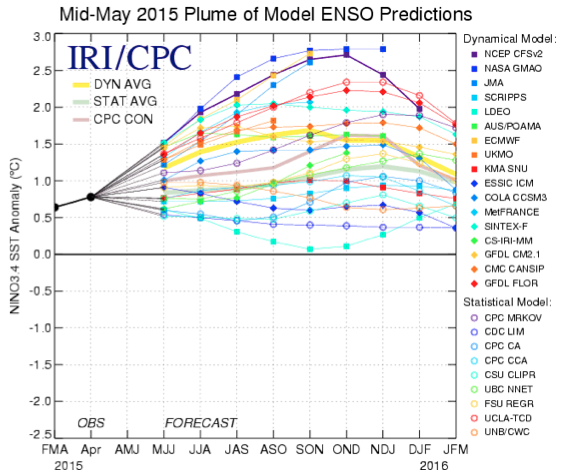 Here is the CPC update of 4/20/15 that has El Nino at +0.9C. The text of the CPC weekly update says important things about the winds and subsurface warm pool.ONI is at +0.5C. The CPC update of 5/4/15 has El Nino at +1.0C. The ONI is at +0.6C. The CPC update of 5/11/15 has El Nino at +1.0C. 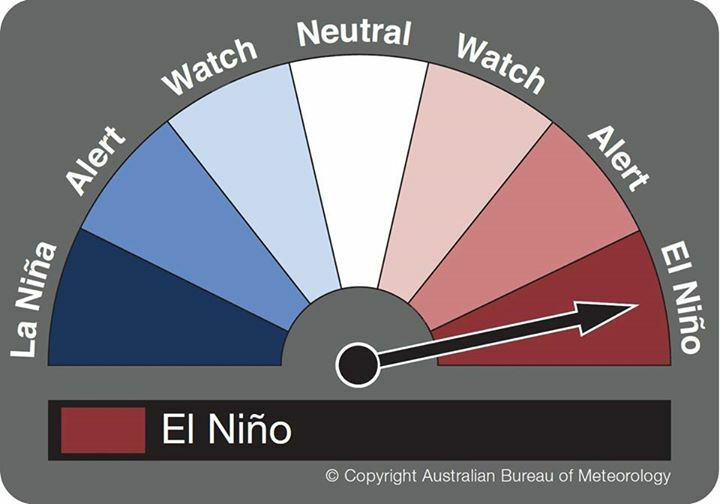 The Aussies declare officially El Nino. 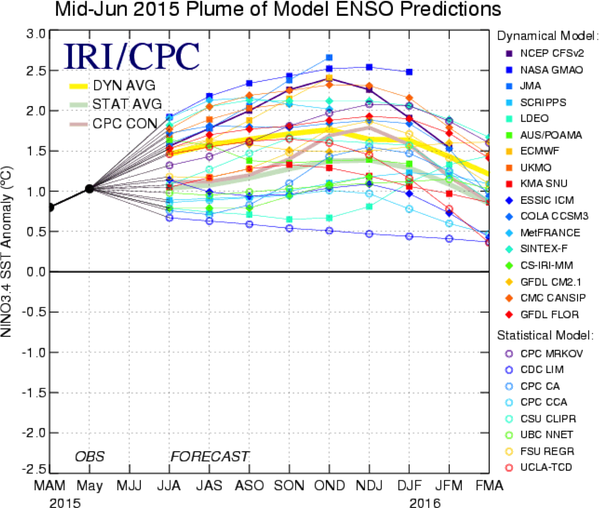 CPC May 14 monthly update upgrades El Nino chances to 90% by Summer and greater than 80% for the rest of 2015. Synopsis: There is an approximately 90% chance that El Niño will continue through Northern Hemisphere summer 2015, and a greater than 80% chance it will last through 2015. By early May 2015, weak to moderate El Niño conditions were reflected by above-average sea surface temperatures (SST) across the equatorial Pacific (Fig. 1), and by the corroborating tropical atmospheric response. The latest weekly Niño indices were +1.2oC in the Niño-4 region, +1.0oC in the Niño-3.4 region, and +1.2oC and +2.3oC in the Niño-3 and Niño-1+2 regions, respectively (Fig. 2). Subsurface temperature anomalies remained substantially above average (Fig. 3), partly in response to a downwelling oceanic Kelvin wave, which resulted in strong positive subsurface anomalies across the central and eastern Pacific (Fig. 4). This anomalous warmth has subsequently persisted in association with El Niño-related ocean-atmosphere coupling. This coupling includes enhanced convection over the central equatorial Pacific (Fig. 5), along with persistent low-level westerly wind anomalies over the western and central equatorial Pacific and persistent upper-level easterly wind anomalies over the central Pacific. Also, the equatorial Southern Oscillation Index (EQSOI) remained negative during the month. Collectively, these features reflect weak to moderate strength El Niño conditions. Nearly all models predict El Niño (3-month values of the Niño-3.4 index 0.5oC or greater) to continue throughout 2015, and many are also predicting SST anomalies to increase during the next several months (Fig. 6). These forecasts are supported by the continuation of positive subsurface temperature anomalies, enhanced convection near the Date Line, and the persistence of low-level westerly wind anomalies. Given these factors, it is likely that SST anomalies will continue to increase in the coming months. However, model forecast skill tends to be lower during the Northern Hemisphere spring, which somewhat limits confidence in these forecasts. Therefore, there remains considerable uncertainty about how strong this event may become. In summary, there is an approximately 90% chance that El Niño will continue through Northern Hemisphere summer 2015, and a greater than 80% chance it will last through 2015 (click CPC/IRI consensus forecast for the chance of each outcome for each 3-month period). The mid-May plume of models have the peak at +1.6C but there is a spread among them. CPC update od 5/26/15 has El Nino at +1.1C. CPC June update has greater than 90% of El Nino thru fall and greater than 85% thru winter. Synopsis: There is a greater than 90% chance that El Niño will continue through Northern Hemisphere fall 2015, and around an 85% chance it will last through the 2015-16 winter. During May, sea surface temperatures (SST) anomalies increased across the central and eastern equatorial Pacific Ocean (Fig. 1 & Fig. 2). All of the Niño indices were in excess of +1.0oC, with the largest anomalies in the eastern Pacific, indicated by recent weekly values of +1.4oC in Niño-3 and +1.9oC in Niño-1+2 (Fig. 2). After a slight decline in April, positive subsurface temperature anomalies strengthened during May (Fig. 3) in association with the progress of a downwelling oceanic Kelvin wave (Fig. 4). In addition, anomalous low-level westerly winds remained over most of the equatorial Pacific, and were accompanied by anomalous upper-level easterly winds. The traditional and equatorial Southern Oscillation Index (SOI) were both negative, consistent with enhanced convection over the central and eastern equatorial Pacific and suppressed convection over Indonesia (Fig. 5). Collectively, these atmospheric and oceanic features reflect an ongoing and strengthening El Niño. Nearly all models predict El Niño to continue throughout 2015, with many predicting SST anomalies to increase into the late fall 2015 (Fig. 6). For the fall and early winter, the consensus of forecasters slightly favors a strong event (3-month values of the Niño-3.4 index +1.5oC or greater), relative to a weaker event. However, this prediction may vary in the months ahead as strength forecasts are the most challenging aspect of ENSO prediction. A moderate, weak, or even no El Niño remains possible, though at increasingly lesser odds. There is a greater than 90% chance that El Niño will continue through Northern Hemisphere fall 2015, and around an 85% chance it will last through the 2015-16 winter (click CPC/IRI consensus forecast for the chance of each outcome for each 3-month period). CPC 6/15/15 update has Nino 3.4 at +1.3C. The Mid-June plume of ENSO models have a consensus of Moderate El Nino at +1.5C. It looks like it peaks at a tri-monthly of +1.7C. I'm not the most knowledgeable in ENSO metrics but that would put this Niño in strong territory for some length of time. CPC 6/22/15 update has Nino 3.4 up to +1.4C. During June, sea surface temperatures (SST) anomalies exceeded +1.0oC across the central and eastern equatorial Pacific Ocean (Fig. 1). The largest SST anomaly increases occurred in the Niño-3 and Niño-3.4 regions, while the Niño-4 and Niño-1+2 indices remained more constant through the month (Fig. 2). Positive subsurface temperature anomalies weakened (Fig. 3) due to the eastward shift of an upwelling oceanic Kelvin wave, which reduced above-average temperatures at depth in the central and east-central equatorial Pacific (Fig. 4). In many respects, the atmospheric anomalies remained firmly coupled to the oceanic warming. Significant westerly winds were apparent in the western equatorial Pacific and anomalous upper-level easterly winds continued. The traditional and equatorial Southern Oscillation Index (SOI) were both negative, which are consistent with enhanced convection over the central and eastern equatorial Pacific and suppressed convection over Indonesia (Fig. 5). Collectively, these atmospheric and oceanic features reflect an ongoing and strengthening El Niño. Nearly all models predict El Niño to continue into the Northern Hemisphere winter 2015-16, with many multi-model averages predicting a strong event at its peak strength (3-month values of the Niño-3.4 index of +1.5oC or greater; Fig. 6). At this time, the forecaster consensus is in favor of a significant El Niño in excess of +1.5oC in the Niño-3.4 region. Overall, there is a greater than 90% chance that El Niño will continue through Northern Hemisphere winter 2015-16, and around an 80% chance it will last into early spring 2016 (click CPC/IRI consensus forecast for the chance of each outcome for each 3-month period). CPC weekly update goes up to +1.5C at Nino 3.4 reaching the strong el nino category.